Hyundai will use this month’s 2018 Los Angeles auto show to unveil a full-size SUV the automaker confirmed Thursday will be called a Palisade. Due on sale next year as a 2020 model, the Palisade will offer seating for eight and features normally found on luxury vehicles, such as premium cabin materials and advanced safety technologies. Hyundai previewed the design with the Grandmaster concept (shown below) unveiled in June. We’ve also spied prototypes testing in the wild over the course of the past year. 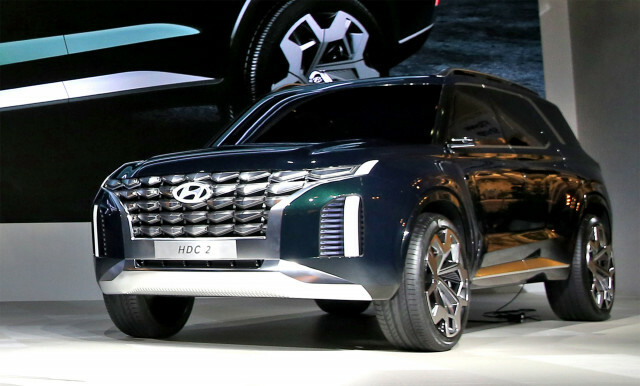 Though camouflaged, the prototypes hint at a large, boxy design, with the treatment for the grille and headlights similar to what we see on the redesigned 2019 Hyundai Santa Fe. Underpinning the vehicle is a new front-wheel-drive platform with transverse engine mounting and all-wheel-drive capability. The recently revealed 2020 Kia Telluride is also based on this platform. Meanwhile, we can look forward to a V-6 as the standard powertrain and potentially a hybrid option at some point. Potential rivals include the Chevrolet Suburban and Tahoe, Dodge Durango, Ford Expedition, Honda Pilot, Nissan Armada, Toyota Sequoia, and the aforementioned Telluride from Kia. The Palisade may even be built at the same plant in West Point, Georgia as the Telluride. We’ll have all the details soon as the L.A. auto show opens to the press November 28. To learn about some of the other vehicles set to appear, head to our dedicated hub.